Jeb Bush and Hillary Clinton will face off in the presidential race—but the real battle will be between the billionaires backing them. It’s happening. As expected, dynastic politics is prevailing in campaign 2016. After a tease about as long as Hillary’s, Jeb Bush (aka Jeb!) officially announced his presidential bid last week. Ultimately, the two of them will fight it out for the White House, while the nation’s wealthiest influencers will back their ludicrously expensive gambit. And here’s a hint: Don’t bet on Jeb not to make it through the Republican gauntlet of 12 candidates (so far). After all, the really big money’s behind him. Last December, even though out of public office since 2007, he had captured the support of 73 percent of The Wall Street Journal’s “richest CEOs.” Though some have as yet sidestepped declarations of fealty, count on one thing: The big guns will fall into line. They know that, given his family connections, Jeb is their best path to the White House and they’re not going to blow that by propping up some Republican lightweight whose father and brother weren’t president, not when Hillary, with all her connections and dynastic power, will be the opponent. That said, in the Bush-Clinton battle to come, no matter who wins, the bankers and billionaires will emerge victorious. This article originally appeared at TomDispatch.com. To stay on top of important articles like these, sign up to receive the latest updates from TomDispatch.com. This piece has been adapted and updated by Nomi Prins from her book All the Presidents’ Bankers: The Hidden Alliances That Drive American Power, recently out in paperback (Nation Books). The issue of political blood and family lines in Washington is not new. There have been three instances in our history in which presidents have been bonded by blood. Our second president John Adams and eighth president John Quincy Adams were father and son. Theodore and Franklin Delano Roosevelt were cousins. And then, of course, there were our 41st and 43rd presidents, George H.W. and George W.
If Jeb becomes the 45th president, it will be the first time that three administrations share the same blood and “dynastic” will have a new meaning in America. The Bush political-financial legacy began when President Ronald Reagan chose Jeb’s father, George H.W., as his vice president. Reagan was also the first president to choose a Wall Street CEO, Donald Regan, as Treasury secretary. Then-CEO of Merrill Lynch, he happened to be a Bush family friend. And talk about family tradition: Once upon a time (in 1900, to be exact), Jeb’s great-grandfather, George Herbert Walker, founded G.W. Walker & Company. It was eventually acquired by—you guessed it!—Merrill Lynch, which was consumed by Bank of America at the height of the 2008 financial crisis. That merger was pressed by, among others, George W. Bush’s Treasury secretary (and former Goldman Sachs chairman and CEO), Hank Paulson. It helped John Thain, Paulson’s former number two at Goldman Sachs, who was by then Merrill Lynch’s CEO, out of a tight spot. Now chairman and CEO of CIT Group, Thain is also a prominent member of the Republican Party who sponsored high-ticket fundraisers for John McCain during his 2008 campaign. Expect him to be there for Jeb. Paulson endorsed Jeb for president on April 15. That’s how these loops go. As vice president, George H.W. co-ran a task force with Donald Regan dedicated to breaking down the constraints of the 1933 Glass-Steagall Act, so that Wall Street banks could become ever bigger and more complex. Once president, Bush promoted deregulation, while reconfirming Alan Greenspan, who did the same, as the chairman of the Federal Reserve. In 1999, after President Bill Clinton (Hillary!) finished the job that Bush had started by overseeing the repeal of Glass-Steagall, banks began merging like mad and engaging in increasingly risky and opaque practices that led to the financial crisis that came to a head in George W.’s presidency. In other words, it’s a small world at the top. The meaning of all this: No other GOP candidate has Jeb’s kind of legacy political-financial power. Period. To grasp the interconnections between the Bush family and Wall Street that will put heft and piles of money behind his candidacy, however, it’s necessary to step back in time and see just how his family helped lead us to this moment of his. By the time George H.W. Bush became president on January 20, 1989, the economy was limping. Federal debt stood at $2.8 trillion. The savings-and-loan crisis had escalated. Still, his deregulatory financial policies remained in sync with those of the period’s most powerful bankers, notably Citicorp chairman John Reed, Chase (now JPMorgan Chase) Chairman Willard Butcher, JPMorgan chief Dennis Weatherstone, and Bank of America Chairman Tom Clausen. With the economic odds stacked against him, Bush also remained surrounded by his most loyal, business-friendly companions in Washington, who either had tight relationships with Wall Street or came directly from there. In a preordained arrangement with President Reagan, Bush retained Nicholas Brady, the former chairman of the board of the blue-blood Wall Street investment bank Dillon, Read & Co., as Treasury secretary. A few months later, under Alan Greenspan’s Fed, JPMorgan Securities, the investment banking subsidiary of JPMorgan Chase, became the first bank subsidiary since the Great Depression to lead a corporate bond underwriting. Over the next decade, commercial banks would issue billions of dollars of corporate debt on behalf of energy and public utility companies as a result of Greenspan’s decision to open that door and Bush’s deregulatory stance in general. A chunk of it would implode in fraud and default after Bush’s son became president in 2001. The deregulation of the S&L industry between 1980 and 1982 had enabled those smaller banks, or thrifts—focused on taking deposits and providing mortgages—to compete with commercial banks for depositors and to invest that money (and money borrowed against it) in more speculative real-estate ventures and junk-bond securities. When those bets soured, the industry tanked. Between 1986 and 1989, 296 thrifts failed. An additional 747 would shut down between 1989 and 1995. Among those, Silverado Banking went bankrupt in December 1988, costing taxpayers $1.3 billion. Neil Bush, George H.W.’s son, was on the board of directors at the time. He was accused of giving himself a loan from Silverado, but denied all wrongdoing. George H.W.’s second son, Jeb Bush, had already been dragged through the headlines in late 1988 for his real estate relationship with Miguel Recarey Jr., a Cuban-American mogul who had been indicted on one charge of fraud and was suspected of racking up to $100 million worth of Medicare-related fraud charges. Meanwhile, the president was crafting his bailout plan to stop the S&L bloodletting. On August 9, 1989, he signed the Financial Institution Reform, Recovery, and Enforcement Act, which proved a backdoor boon for the big commercial banks. Having helped stuff the S&Ls with toxic real-estate products, they could now profit by selling the bonds that were constructed as part of the bailout plan, while the government subsidized the entire project. Within six years, the Resolution Trust Corporation and the Federal Savings and Loan Insurance Corporation had sold $519 billion worth of assets for 1,043 thrifts that had gone belly up. Key Wall Street banks were involved in distributing those assets and so made money on financial destruction once again. Washington left the public on the hook for $124 billion in losses. The Bush administration and the Fed’s response to the S&L crisis (as well as to a concurrent third-world debt crisis) was to subsidize the banking system with federal and multinational money. In this way, a policy of privatizing bank profits and socializing their losses and risks became embedded in the American political system. The S&L trouble sparked a broader credit crisis and recession. Congress was, by then, debating the “modernization” of the financial services industry, which in practice meant breaking down remaining barriers within institutions that had separated deposits and loans from securities creation and trading activities. This also meant allowing commercial banks to expand into nontraditional banking activities, including insurance provision and fund management. The Bush administration aided the bankers by advocating the repeal of key elements of the Glass-Steagall Act. Related bills to dismantle that Depression-era act won the support of the House and Senate banking committees in the fall of 1991, though they were defeated in the House in a full vote. Still, the writing was on the wall. What a Republican president had started, a Democratic one would soon complete. In the meantime, the Bush administration was covering all the bases when it came to the repeal of Glass-Steagall, which would be the nail in the coffin of decades of banking constraint. As commercial bankers pushed to enter non-banking businesses, Richard Breeden, Bush’s SEC chairman, began championing the other side of the Glass-Steagall divide—fighting, that is, for the rights of investment banks to own commercial banks. And little wonder, since such a deregulation of the financial system meant a potential expansion of Breeden’s power: the SEC would be tasked with monitoring the growing number of businesses that banks could enter. Meanwhile, Wendy Gramm, head of the Commodity Futures Trading Commission (CFTC), promoted another goal the bankers wanted: unconstrained derivatives trading. Gramm had first been appointed chair of the CFTC in 1988 by Reagan (who called her his “favorite economist”) and was then reappointed by Bush. She was determined to push for unregulated commodity futures and swaps—in part in response to lobbying from a Texas-based energy trading company, Enron, whose name would grow far more familiar to Americans in the years to come. While awaiting legislative approval, bankers started sending their trading exemption requests to Gramm and she began granting them. In early 2001, in the fading light of the rosy Clinton economy and an election result validated by the Supreme Court, the second President Bush entered the White House. A combination of Glass-Steagall repeal and the deregulation of the energy and telecom sectors under Clinton catalyzed a slew of mergers that consolidated companies and power in those industries upon fabricated books. The true state of the economy, however, remained well hidden, even as it teetered on a flimsy base of fraud, inflated stocks, and bank-created debt. In those years, the corporate and banking world still appeared glorious amid so many mergers. But the bankers’ efforts to support those transactions would soon give way to a spate of corporate bankruptcies. It was the Texas-based energy-turned-trading company Enron that would emerge as the poster child for financial fraud in the early 2000s. It had used the unregulated derivatives markets and colluded with bankers to create a slew of colorfully named offshore entities through which the company piled up debt, shirked taxes, and hid losses. The true status of Enron’s fictitious books and those of other corporate fraudsters nonetheless remained unexamined in part because another crisis garnered all the attention. The 9/11 attacks at the World Trade Center, blocks away from where many of Enron’s trading partners were headquartered (including Goldman Sachs, where I was working that day), provided the banking industry with a reprieve from probes. The president instead called on bankers to uphold national stability in the face of terrorism. On September 16, 2001, George W. famously merged financial and foreign policy. “The markets open tomorrow,” he said. “People go back to work and we’ll show the world.” To assist the bankers in this mission, Bush-appointed SEC chairman Harvey Pitt waived certain regulations, allowing corporate executives to prop up their share prices as part of a plan to demonstrate national strength by elevating market levels. That worked—for about a minute. On October 16, 2001, Enron posted a $681 million third-quarter loss and announced a $1.2 billion hit to shareholders’ equity. The reason: an imploding pyramid of fraudulent transactions crafted with banks like Merrill Lynch. The bankers were now potentially on the hook for billions of dollars, thanks to Enron, a client that had been bulked up through the years with bipartisan support. Amid this financial turmoil, Bush was focused on retaliation for 9/11. On January 10, 2002, he signed a $317.2 billion defense bill. In his State of the Union address, he spoke of an “Axis of Evil,” of fighting both the terrorists and a strengthening recession, but not of Enron or the dangers of Wall Street chicanery. In 2001 and again in 2002, however, corporate bankruptcies would hit new records, with fraud playing a central role in most of them. Telecom giant WorldCom, for instance, was found to have embellished $11 billion worth of earnings. It would soon supplant Enron as America’s biggest fraud of the moment. On July 9, George W. finally unveiled a plan to “curb” corporate crime in a speech given in the heart of New York’s financial district. Taking the barest of swipes at his Wall Street friends, he urged bankers to provide honest information to investors. The signals were now clear: bankers had nothing to fear from their commander in chief. That Merrill Lynch, for example, was embroiled in the Enron scandal was something the president would ignore—hardly a surprise, since the company’s alliances with the Bush family stretched back decades. Three weeks later, he would sign the Sarbanes-Oxley Act, purportedly ensuring that CEOs and CFOs would confirm that the information in their SEC filings had been presented truthfully. It would prove a toothless and useless deterrent to fraud. And then the president acted: on March 19, 2003, he launched the invasion of Iraq with a shock-and-awe shower of cruise missiles into the Iraqi night sky. Two days later, by a vote of 215 to 212, the House approved his $2.2 trillion budget, including $726 billion in tax cuts. Shortly thereafter—a signal to the banking industry if there ever was one—he appointed former Goldman Sachs Chairman Stephen Friedman director of the National Economic Council, the same role another Goldman Sachs alumnus, former co-Chairman Robert Rubin, had played for Bill Clinton. By the end of 2003, grateful bankers were already amassing funds for Bush’s 2004 reelection campaign. A bevy of Wall Street Republicans, including Goldman Sachs Chairman and CEO Henry Paulson, Bear Stearns CEO James Cayne, and Goldman Sachs executive George Herbert Walker IV (the president’s second cousin), became Bush “Pioneers” by raising at least $100,000 each. The top seven financial firms officially raised nearly $3 million for George W.’s campaign. Merrill Lynch emerged as his second-biggest corporate contributor (after Morgan Stanley), providing more than $586,254. The firm’s enthusiasm wasn’t surprising. Donald Regan had been its chairman, and the Bush-founded investment bank G.H. Walker and Company, which employed members of the family over the decades, had been absorbed into Merrill in 1978. Merrill Lynch CEO Earnest “Stanley” O’Neal received the distinguished label of “Ranger” for raising more than $200,000 for Bush’s reelection campaign. It was a sign of the times that O’Neal and Cayne hosted Bush’s first New York City reelection fundraiser in July 2003. Meanwhile, from 2002 to 2007, under George W.’s watch, the biggest US banks would fashion nearly 80 percent of the approximately $14 trillion worth of global mortgage-backed securities (MBS), asset-backed securities, collateralized debt obligations, and other kinds of packaged assets created in those years. And subprime loan packages would soon become the fastest-growing segment of the MBS market. In other words, the financial products exhibiting the most growth would be the ones containing the most risk. Under Bush, Paulson, and Bernanke, the banking sector would buckle and take the global economy down with it. The main American recipients of AIG’s bailout would, in fact, be legacy Bush-allied firms: Goldman Sachs ($12.9 billion), Merrill Lynch ($6.8 billion), Bank of America ($5.2 billion), and Citigroup ($2.3 billion). Lehman crashed, but Merrill Lynch and AIG were saved. The bankers with the strongest alliances to the Bush family (and the White House in general) needed AIG to survive. And it did. But the bloodletting wasn’t over. On September 18, 2008, George W. would tell Paulson, “Let’s figure out the right thing to do and do it.” He would later write, “I had made up my mind: the US government was going all in.” And he meant it. During his last months in office, the Big Six banks (and marginally other institutions) would thus be subsidized by an “all-in” program designed by Bernanke, Paulson, and Geithner—and later endorsed by President Barack Obama. The bankers’ unruliness had, however, already crippled the real economy. Over the next few months, Bank of America, Citigroup, and AIG all needed more assistance. And in that year, the Dow Jones Industrial Average would lose nearly half its value. At the height of the bailout period, $19.3 trillion in subsidies were made available to keep (mostly) American bankers going, as well as government-sponsored enterprises like Fannie Mae and Freddie Mac. As George W. headed back to Texas, the economy and markets went into free fall. Jump seven years ahead and, with the next Bush on the rise and the money once again flowing in, it’s still the age of bankers. Jeb already has three mega-Super PACs—Millennials for Jeb, Right to Rise, and Vamos for Jeb 2016—under his belt. His Right to Rise Policy Solutions group, which, as a 501(c)(4) nonprofit, is not even required to disclose the names of its donors, no less the size of their contributions, is lifting his contribution tally even higher. None of these groups have to adhere to contribution limits and the elite donors who contribute to them often prove highly influential. After all, that’s where the money really is. In the 2012 presidential election, the top 100 individual contributors to Super PACs and their spouses represented just 1 percent of all donors, but gave a staggering 67 percent of the money. Of those, Republican billionaire Sheldon Adelson and his wife, Miriam, donated $92.8 million to conservative groups, largely through “outside donor groups” like Super PACs that have no contribution limits. Texas billionaire banker mogul Harold Simmons and his wife, Annette, gave $26.9 million, and Texas billionaire homebuilder Robert Perry coughed up $23.95 million. Nebraska billionaire (and founder of the global discount brokerage TD Ameritrade) John Joe Ricketts dished out $13.05 million. Despite some early posturing around other candidates with fewer legacy ties, these heavy hitters could all end up behind Bush 45. Dynasties, after all, establish the sort of connections that lie in wait for the next moment of opportune mobilization. Let’s be clear. The Bush family is all in on Jeb and its traditional banking allies are not likely to be far behind. There is tradition, there are ties, there is a dynasty to protect. They are not planning to lose this election or leave the family with a mere two presidents to its name. The Wall Street crowd began rallying behind Jeb well before his candidacy was official. Private equity titan Henry Kravis hosted a 25-guest $100,000-per-head gathering at his Park Avenue abode in February, one of six events with the same entry fee. In March, Jeb had his first Goldman Sachs $5,000-per-person event at the Ritz Carlton in New York City, organized by Dina Powell, Goldman Sachs Foundation head and George W. Bush appointee for assistant secretary of state. A more exclusive $50,000 per head event was organized by Goldman Sachs exec, Jim Donovan, a key fundraiser and adviser for Mitt Romney who is now doing the same for Jeb. And then there’s the list of moneyed financiers with fat wallets still to get behind Jeb. New York hedge fund billionaire Paul Singer, who donated more than any other conservative in the 2014 election, has yet to swoop in. Given the alignment of his foreign-financial-policy views and the Bush family’s, however, it’s just a matter of time. 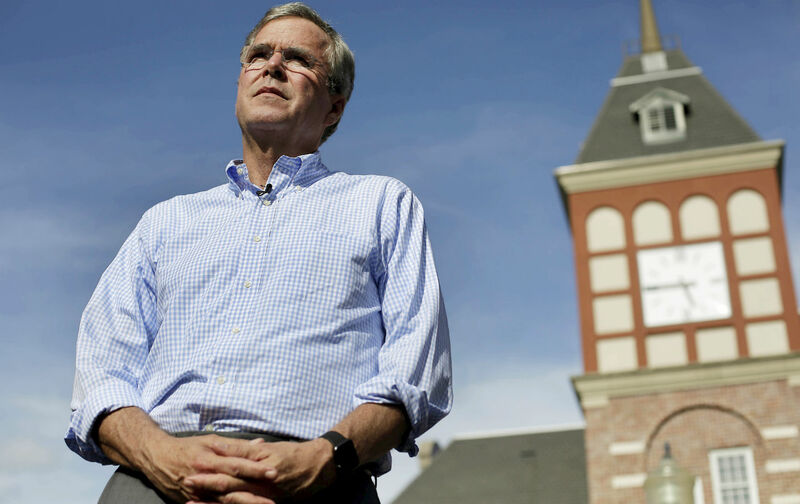 With the latest total Super-PAC figures still to be disclosed, we do know that Jeb’s Right to Rise Super PAC claims to have raised $17 million from the tri-state (New York, New Jersey, and Connecticut) area alone so far. Its head, Mike Murphy, referred to its donors in a call last week as “killers” he was about to “set loose.” He intimated that the July disclosures would give opponents “heart attacks.” Those are fighting words. Sure, all dynasties end, but don’t count on the Bush-Banker alliance going belly up any time soon. Things happen in this country when mountains of money begin to pile up. This time around, the Bush patriarchy will call in every chip. And know this: Wall Street will be going “all in” for this election, too. Jeb(!) and Hillary(!) will likely split that difference in the primaries, then duke it out in 2016. Along the way, every pretense of mixing it up with the little people will be matched by a million-dollar check to a Super PAC. The cash thrown about in this election will be epic. It’s not the fate of two parties but of two dynasties that’s at stake.